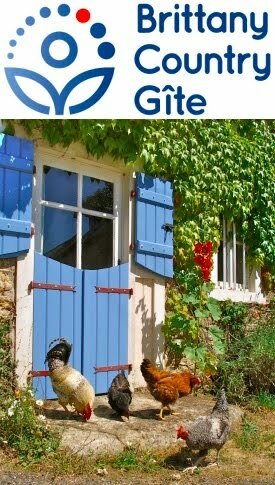 Monday morning, all things being equal (normalement in French) a very tall Frenchman by the name of Christophe Le Petit will turn up with a digger to finish installing our horizontal plant filter grey water treatment system. (Grey water is water from the kitchen and bathroom sinks, the shower and the washing machine but not the flush WC, which we’re replacing with a dry compost toilet.) Cleaned water from the plant filter will go into a large wildlife pond. Friends and neighbours have asked us whether we’ll put ducks in it. No. Ducks (delightful creatures that we hope to have in the future) would eat all the vegetation and make the pond very messy. Fish? Also problematic, depending what sort they are. We don’t want them eating plants or tadpoles but have been told that roach (gardon in French) would be a good fish, something to eat mosquito larvae but not otherwise affect the ecosystem. This will be a wildlife pond, a thing of beauty we hope, something to increase biodiversity, such as supporting slug-eating frogs and toads, which should benefit our adjacent vegetable patch and polytunnel. Christophe reckons we’ll have an excess of a trailer or two of earth after the pond landscaping and asked me where we could put it. There’s a big hole in the forest ride I cut the winter before. Now, the logs from the trees I felled last winter—thinning a plot of sycamore—are still in the our wood. Can you see the first inklings of a cunning plan? Christophe takes the trailer of earth to the wood, dumps it in previously mentioned hole and levels it smooth, then uses his loading bucket to scoop up logs from the large, rough pile and bring them back in his trailer. Also, his lovely trailer has a tipping action, so loading and unloading by hand (which I’ve done for the last two years) is all done in an instant. With sunlight now allowed in, the ride has grown a green carpet of nettles, brambles and other assorted plants, shrubs and saplings. 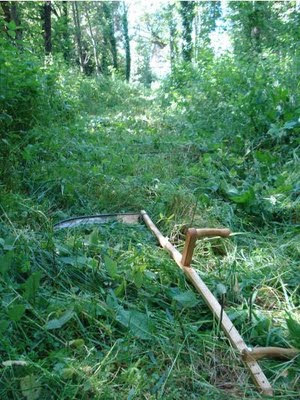 I’ve been scything this over the last few days, an hour or two at a time, a job made all the more fun by the new bar that’s opened at the top of the lane leading to our woodland: what luck! On a visit to the woods a few months ago, seeing that there was work being done to a building that had been deserted as long as we’ve known it, Gabrielle went over to say hello. In fact, it’s not so much new as an old bar reopened. 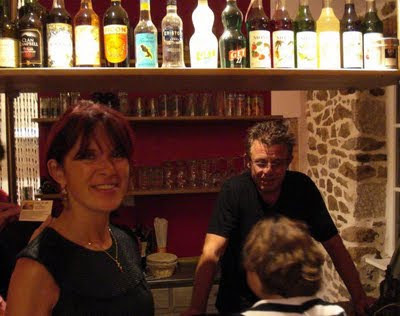 Michel’s parents and grandparents ran the bar, which has been closed for quite a few years. They asked if she and Alastair (guitar-playing artist friend) would play on their opening night. 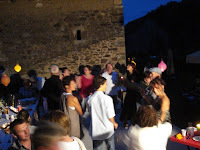 It was a happy evening under a deep blue dusk sky, with loads of dancing, chatting, eating and (moderate) drinking. Caroline, artist Al’s artist partner, got her ever-present sketchbook out and captured the personalities and the movement of the evening in a few deft strokes of her black pen, which fascinated the children. 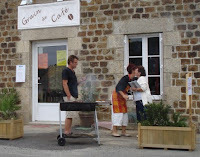 Sensibly keeping on their day jobs, he and his wife Isabelle (in photo below) are open every day in August, then just weekends thereafter. It’s great for our working visits to the wood: a coffee to get us warmed up for work, and a cold beer at the end of the day. 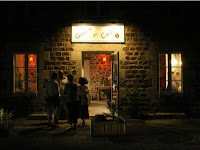 Weekdays during August, they’re also doing food at midday, really tasty home cooking, grilling chops on a wood barbecue outside the front door, for example and the most sumptious of chocolate gateaux, served with crème anglaise (literally, “English cream”, custard by another name). Oh so that's what the little fish are in our 'mar'! Well they must do a good job of eating mosquito larvae as we've not had a single mosquito bite nor even a sighting. I read in The Earthcare Manual recently (p111 para3) that toads rarely eat slugs, but do eat snails. Good because we've got lots of snails here and I'm not up for eating them myself. the bar sounds convivial in the most profund way, enjoy! Thanks for your comment, Alison. We're getting towards the end of the earthworks for our pond and will hopefully be planting it up soon, although it won't look it's best before next Spring. I shall post soon with some pictures.